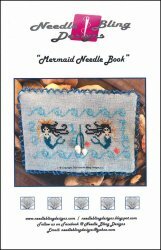 Mermaid Needle Book [C5000] - $8.00 : Yarn Tree, Your wholesale source for cross stitch supplies. Cross stitch pattern by Needle Bling Designs. Two mermaids swimming under blue waves. Shown finished as a needle book. Alphabet included for personalizing. Stitch count 41h x 78w.